The Scottish Rite Center that overlooks Lake Merritt is undergoing a $1.2 million renovation to return the lodge to its original glory. For 60 days, the building will close so workers can replace the roof, install LED lighting and sound systems and make the building handicap accessible. The grand dome theater will get a fresh coat of paint and 24-karat leafing on its details. 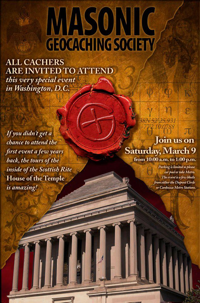 On March 9, 2013 there will be a Masonic Geocaching event at the House of the Temple in Washington, D.C. This is a great opportunity for geocachers from all over to join us in Washington, D.C. to share and exchange ideas, and talk about caching. The event will take place in the rear of the building. We hope everyone will be able to join us for this special Geocaching event in Washington, DC on March 9, 2013. We are honored to have Arturo de Hoyos, Grand Archivist and Grand Historian of Scottish Rite Freemasonry, as the feature speaker for the event! Question: Is Freemasonry a religion? Additional Argument: “I read something in a book that made me wonder about this. 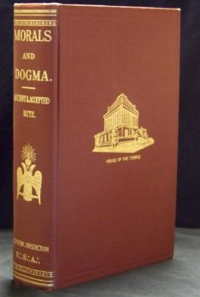 The book is called “Morals and Dogma of the Ancient and Accepted Scottish Rite of Freemasonry” written by Albert Pike. 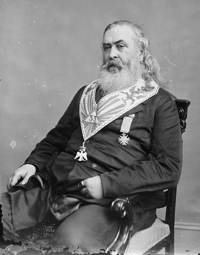 Albert Pike is a confirmed Freemason, in fact there are currently lodges erected in honor of him, such as the Albert Pike Lodge #237 in Hopkins, Minnesota. Since Albert Pike was clearly an authoritative figure within Freemasonry and his book is still used today, is it true that Freemasonry is a religion? It clearly appears to me that this claim is true, however, I would like to hear from some Masons regarding Albert Pike’s statements. Our Supreme Council has in its Archives copies of the Degrees of the Rite of Perfection and of additional Degrees, including the 33°, which were in use at Charleston in 1801. Some of these old Degree documents are fragmentary, and some Degree manuscripts have not survived the centuries. The Knights of Saint Andrew is a chartered service group of the Scottish Rite designed specifically for 32nd Degree Masons. The Knights were first chartered in 1993 at Tulsa Oklahoma where they serve through visible participation in reunions and other Valley activities. Chapters of the Knights are organized to provide social and fraternal activities at the 32nd members and also to serve as a service organization to the Valley.